Note: This post has been updated to reflect Instagram’s changes as of May 11, 2016. 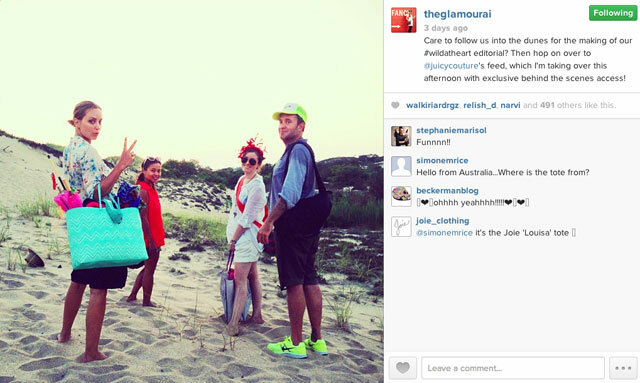 An Instagram contest is an easy way to capitalize on the user-generated content (UGC) trend. Instagram contests require minimal effort from participants, which is one reason they’re so popular. To host an Instagram contest using this template, just ask people to post a photo to Instagram, include your unique hashtag in the caption, and fill out a simple form. 1. Post at the right time. Before you post your photo to Instagram, there are two things to keep in mind: your audience’s time zone and what time they’re most often checking Instagram. Most Instagram users login in the morning, and in the evening, on their way home from work or school. According to analytics company Simply Measured, the best time to post on Instagram is on Wednesdays between 5:00 pm and 6:00 pm. For brands, the least favorable time to post is in the middle of the night because an Instagram photo typically has a life of only around 4 hours before it gets buried in followers’ feeds. Post at times throughout the day that you can assume your audience has down time and is checking their accounts. For example, if you’re a company whose target audience is high school students, post your photo in the afternoon during the time high schoolers are on their lunch break. Or, if you’re a business with lots of New York City- or London-based followers, think about posting during rush hour when you know folks are stuck on trains or busses and have nothing else to do but check their phones. 2. Use popular hashtags. Depending on the industry you’re in, there are popular Instagram hashtags that can be used to get more visibility on your photos. The best way to discover popular hashtags for your industry is to use Google, of course! A simple Google search will tell you all you need to know. Some of the most trendy Instagram hashtags you’ll find include: #tbt (throwback Thursday), #instadaily, #photooftheday, #instagood. Keep in mind: Don’t go nuts with your hashtags! A hashtag paragraph, as I like to call it, at the bottom of your photo is not savvy. It can look a little overzealous and cluttered. 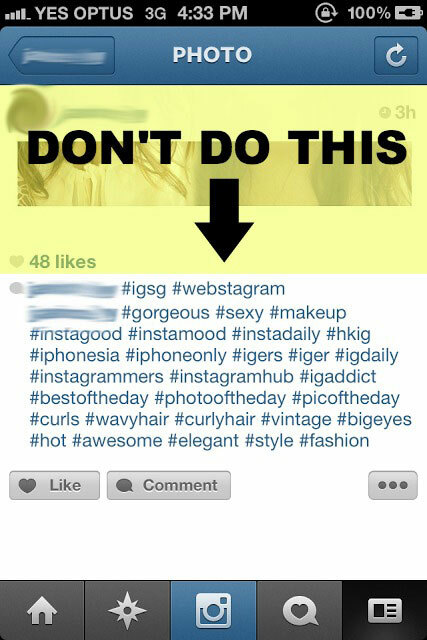 Instead, stick to using 1-3 relevant hashtags per photo. 3. Use your photo captions to ask questions: One of the best ways to get more likes on your Instagram photos is to use your photo’s caption to ask a question. This is a great way to drive not only photo likes, but comments, too. 4. Host a contest on Instagram: Hosting a contest is often the most effective way to boost engagement and get new followers fast on any social network. Since Instagram has grown in popularity, it makes it one of the best social platforms to run a contest. For best practices and tips on how to host a successful Instagram photo contest, click here. If you’re interested in hosting an Instagram campaign, here’s an example from a ShortStack user. 5. Share teasers: For product-based businesses, upload photos to Instagram that feature teasers of a soon-to-be-released product or an exciting event that’s around the corner. Teaser photos are great for catching users’ interest and for driving photo likes! 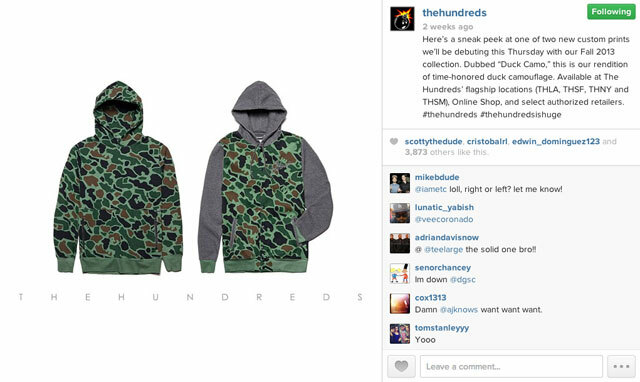 Check out a great example of an Instagram teaser photo from the California-based clothing company The Hundreds. 6. Share candid shots: Think of your brand’s Instagram account as your followers’ backstage pass, or a behind-the-scenes look, at the inner workings of your company. People don’t want to see the same highly polished images your brand uses for adverts, they want to see images that are more relatable and less edited. Your Instagram account should strive to highlight your employees and the work they do. Even if your business employs hundreds of people, featuring even just a few faces from behind your brand allows your brand to appear much more transparent with your followers. Remember: The content you post on Instagram doesn’t always have to be marketing driven, it can be just for fun! After all, these kind of photos often get the best engagement. Stop thinking so much about how to get you’re going to get your branding message across and focus on the essence of the platform, which is a human-centric and playful. A hashtag contest is the simplest way to gather user-generated content (UGC), increase brand awareness and reach a new audience. And people who participate in UGC campaigns are more likely to become customers. It’s easier than ever to feature moderated UGC on your website, and anyone can use a hashtag to participate in your contest. • Instaframe: Instaframe is a free app that allows you to create really awesome photo collages. There are lots of photo collage apps available, but this one is by far my favorite. 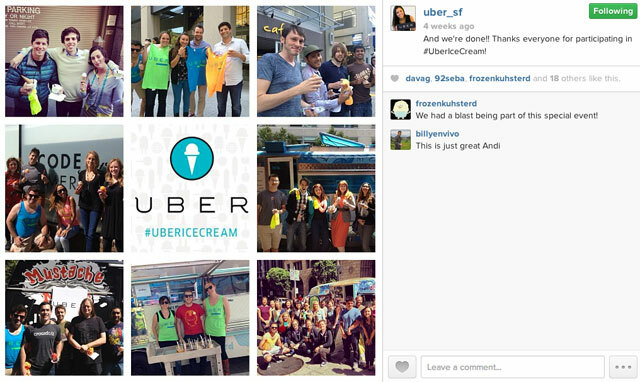 Check out below Uber SF’s cool photo college they posted for their Uber ice cream event! • Picfx: If you want to really pump up the look of your photo with filters, Picfx ($1.99) is your go-to app. It has 100+ effects, textures and frames to choose from, and will automatically format your photo into a square for easy Instagram uploading. • Camera+: Camera+ ($1.99) one of the most popular photo-editing apps available. Use Camera+ to adjust the lighting, brightness, contrast and clarity of your photos. It’s also a really handy app for shooting, as it allows you to zoom more tightly and improve your lighting on the spot! 8. Ask your users for help: If it’s a goal of your brand’s to get on Instagram’s most popular “Explore” page, and you have enough followers to do so, don’t be afraid to ask in the photo caption section of your next uploaded photo. Ask and often you shall receive! 9. Use Instagram video: Instagram videos are the latest way for businesses to engage with fans. Here’s a great example from Ballet Opera de Paris, promoting a new film. "Auditions", nouveau film sur la #3eScène. Expérience sensorielle du trac et magie des voix. Réalisé par Manuela Dalle et Carole Grigy. In short, brands using Instagram video should use it to do the following: spotlight their products, tell a story, entertain and provide value. 10. Welcome a guest Instagrammer: There are lots of “Instagram celebrities” on the platform, meaning Instagram users who have massive following. These people have influence. In a matter of minutes, a photo that an “Instagram celebrity” posts can get thousands of likes and hundreds of comments. If you’re a brand, team up with an Instagram celeb and have them take over your account for a day or during a major event. This is one way to introduce your Instagram celeb’s large following to your brand. The clothing brand Juicy Couture recently did this when they had popular blogger Kelly Framel of The Glamourai take over their Instagram account to post behind-the-scenes photos of a photo shoot for their upcoming campaign. Fellow fashion blogger Chriselle Lim of The Chriselle Factor also took over Nordstrom’s Instagram account recently! 11. Ask for shoutouts or features: This tip is for all my PR people! Reach out to popular Instagrammers, or “Instagram celebrities,” and ask that they mention your Instagram account or feature your product in a photo of theirs. Or better yet, if you’re notified that one of these Instagram influencers mentioned your brand without you asking, reach out to them and say “thanks!” This will help your brand develop a relationship with people who have online influence. The backing of a major Instagram influencer could potentially help drive hundreds of new followers for your brand. 12. 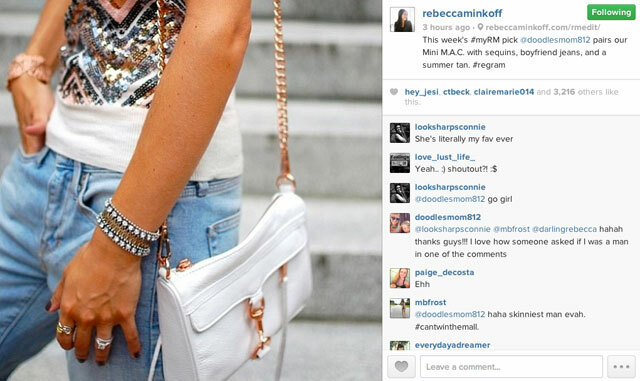 Show love to your followers: One brand that’s a great example for how to show love to your followers is designer Rebecca Minkoff. If you check out their Instagram account, they often share fan-snapped photos that feature their products. By posting fan photos, it encourages other followers to tag their photos with your brand’s hashtag or to mention your brand’s account name in the hopes of being the next fan photo used. 13. Take advantage of your Instagram bio: Don’t neglect your Instagram bio! Use this space to feature a call to action, branded hashtags and web links. Or better still, use ShortStack to build and Instagram campaign that you can easily update without having to change the link in your bio every day. For Instagram users who are new to your brand and come across your account for the first time, this section is important– it often plays a hand in a user’s decision to follow your business or not. 14. Discover new people and brands to follow: If you’re a brand just starting out on the platform and you’re not sure who you should follow, just tap on the magnifying glass that appears in the bottom section of your home screen. Instagram will suggest “Videos you might like” and will show you accounts from other users you might want to check out. BTW, if you’d like some tips on how to be most effective with your time on Instagram, check out 6 Steps for Getting Started on Instagram.